2016 Lazy Bulldog Contest Winner! Welcome to the July 2016 Bulldog of the Month Photo Contest! You've got a bulldog, right? Then this contest is for you, because EVERY bulldog paw-rent has a picture (or 1000) of their precious sleeping bulldog doing what they do best- being LAZY!!!! 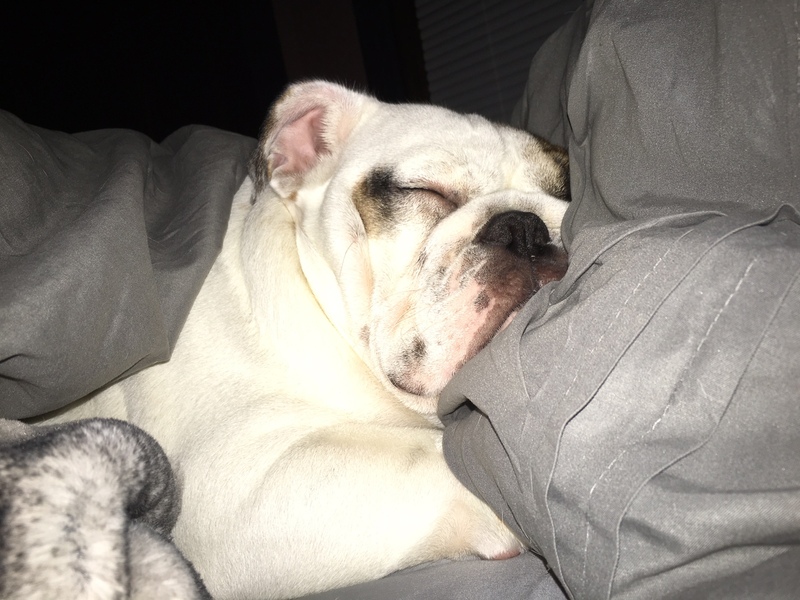 Let's see those beautiful bulldogs showing their super talent of laziness for a chance to win FREE Nuvet Plus! 30 day supply of NuVet Plus Supplement, and $50 donation to any rescue to the winner! If this is the first page you are viewing on our forum, then I really must tell you more about our site before you go! We have a lot of fun here with many events, discussions, daily "Bully" poll, and articles. We welcome all members or if you have a question about your bully health or care, we are happy to give whatever advice and experiences we can share. We hope you check out all our different forums and share your bully experiences with us! Only one photo per user please! If you submit more than one photo we will choose one from your entries. After August 22nd we will no longer accept entries. All photos will be posted within the 4 Paw Members board, and the 4 Paw Members will vote for their favorite photos until the second to last day of that month. Once you enter your photo in this contest you are giving English Bulldog News permission to publish it on their website and newsletter correspondence, and possible future items such as calendars and greeting cards. Your photo must belong to you. Photos cannot contain watermarks. Copyright laws forbid you from entering a photograph that was not taken (or taken with your camera to clarify) and the photo must belong by you. You must be a registered member of English Bulldog News and submit your photo by replying to this topic. International Winners outside of the USA will need to pay a $10 surcharge via paypal due to a massive increase in international shipping rates, or they may choose to donate it to a English Bulldog Rescue in the USA, or to a friend on the forum who resides in the USA. Please! Only one entry. Any additional entries will not be eligible for the contest and will be deleted. Ummm you want Me to do what ??? ?